Heimars World: Jetzt geht's rund! 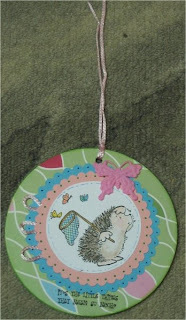 Gorgeous card Heidi, love this cute hedgie and pretty butterfly. Simply adorable, a great card. Oh this is such a sweet card! The colours and image are fab! Thanks for playing along this week! Very cute tag for the challenge Heide - love your image and colouring. Thanks for joining the PBSC this week.